I have a slight obsession with sweet potatoes especially, sweet potato fries. I could eat them at any time of the day- breakfast, lunch, dinner, snack- it doesn't matter. However, I usually have a problem when it comes to baking the fries- not eating the fries. I never seemed to make them exactly how I want them- extra crispy and thin with tons of flavor! I hit the jackpot this time! I think the key is to not coat the fries in too much coconut oil (or olive oil). You do not want the fries drowning in liquid. You also want to either bake them fast on high heat. (425 degrees for 30 or so minutes.) OR bake at 350 for over an hour- but who has time for that? I did experiment with both baking temperatures for this recipe. The first time I baked the first at 350 for 50 minutes, then turned the oven to 375 degrees and baked for another 30 minutes. Flipping the fries every so often. The second time, I baked the fries at 425 for a little longer than 30 minutes. At this temperature I was checking the fries every ten minutes & turning so all sides were cooked. (Be careful to not keep the oven door open as the heat will escape). I didn't notice a major difference. My only suggestion would be that if you are baking the fries at a higher heat you will want to make sure that they are evenly cut. If any fries are thinner than the others they will quickly burn. 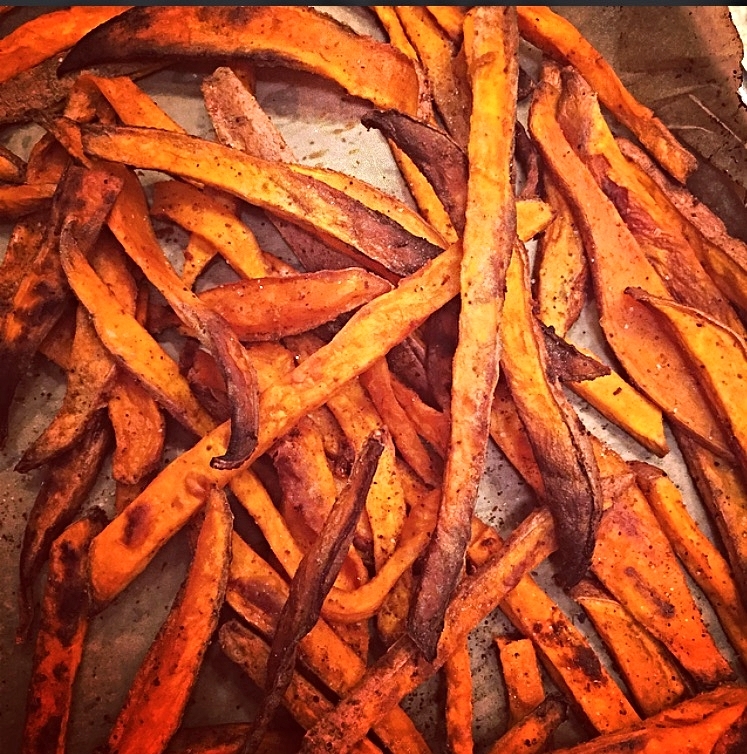 With this recipe, the sweet potato fries turned out crispy, a little soft in the middle, a little sweet, a little spicy, and a little caramelized. Not to mention, they are nourishing, healthy, and guilt free. *Adjust all spices to taste. Preheat oven to 425. Line a baking sweet with parchment paper and set aside. Wash the sweet potatoes and pat dry. Cut the sweet potatoes in 1/4 inch sized slices. In a bowl mix together the coconut oil, maple syrup or brown sugar (if you use brown sugar you MIGHT need to add a little more coconut oil), cumin, cayenne pepper, chili powder, salt, pepper, paprika. Place the thin slices of sweet potatoes in a large mix bowl and pour the liquid over. Mix well. You want to make sure that the potatoes not overly oiled- this will result in a soggy fry- unless that's your thing! Spread the fries over the baking sheet, with space between each. Bake until golden brown and crispy. Usually anywhere from 30-45 minutes. Turn the fries a few times so all sides become evenly crisp. Once finished, sprinkle with sea salt and serve! If you have time- you can turn the oven off, open the door and allow the fries to sit in the oven for 15 minutes. This will allow the fries to crisp even more!